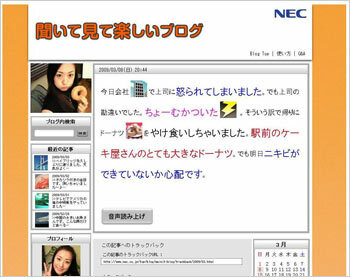 Tokyo, April 6, 2009 - NEC Corporation announced today the development of two new technologies that evaluate an author’s feelings based on text data in order to automatically generate entertaining blog content. The technologies produce a variety of text decorations and feature an entertaining text-to-speech function that generates synthesized speech based on the positive or negative emotions expressed in a body of text. The two newly developed technologies are represented by a “state of mind assessment technology,” which analyzes text data in order to assess whether the feelings expressed by an author are positive or negative, in addition to a “variable voice tone synthesis technology” that uses the identified feelings to create diverse variations in the tone of synthesized voices.